The Business Process Management (BPM) initiative at IWCO Direct started in our Customer Experience (CX) departments and has now expanded to our Strategic Sourcing, Purchasing, and Content Development departments. This initiative has provided our employees with at-your-fingertips access to all departmental processes and procedures. These resources are used to train new employees, equip project leaders with Current State processes, cross-train with other departments, and provide information to our clients and vendor partners. BPM also empowers our Subject Matter Experts (SMEs) to share their knowledge and work together to create source-of-truth documentation for the entire organization. This documentation was particularly handy immediately after the hurricanes in Texas, Florida, and Puerto Rico, when our clients needed mailpieces headed to the stricken areas removed from the mailstream. Our internal Extraction Process went into effect at lightning speed and each department involved completed their piece of the process to satisfy the urgent client requirements. All parties involved were pleased that the process was clearly documented and the most current documentation was readily available—all thanks to the BPM system. BPM resources continue to evolve after they are implemented, too. They are kept up-to-date by technical writers working with SMEs to review, enhance, and publish the information online. As new details and more refined procedural steps are discovered, this gives us a platform and standard process for sharing and disseminating the information through the BPM system. Overall, employees are pleased to have this resource, excited to use it to train others, and proud of their contributions. It’s important to keep the BPM knowledgebase in focus during projects that result in updates to our workflow, so we can keep the documented processes and procedures current. Knowledge assets like these empower our employees to satisfy many types of client inquiries regarding our standard business practices, such as quality assurance steps. If a client inquires about our proofing process, for example, we can respond to their inquiry right away by providing a step-by-step visual diagram of that process as well as the people and tools involved in each step. Faster and better employee onboarding. Our clients will never hear the excuse, “I’m not sure how to answer your question because I’m new here.” Even the newest members of the CX team always have access to beginner and advanced training material that has captured the expertise of our senior CX team members. 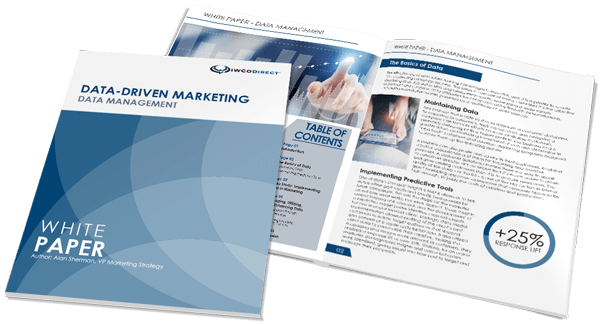 Coupled with exceptional customer service skills, the BPM resources enable our employees to provide the best direct marketing campaign management in the industry. Access to IWCO Direct internal processes. Need to understand our quality control process? Want to learn more about the inputs we require to get the job done? Your CX team members can quickly provide you with visual and professional illustrations of our processes. This often helps our teams “speak the same language” with clients when onboarding new campaigns or working through a program change. Our documentation can help our clients create their own documentation. Our CX teams can also use our proprietary BPM resources to help clients create documentation specifically for their internal needs. For example, if a client needs to implement an exception process (a process that’s different from our standard IWCO Direct process), our CX team will use the existing BPM documentation to make a few adjustments and rebrand the documentation for their client’s specific workflow needs. Again, this keeps everyone involved on the same page using documentation that is clear and consistent. At IWCO Direct, we strive to balance standardization with flexibility. Our BPM initiative gives us the foundation upon which we build our standards to withstand any storm. Get in touch with your account team if you’d like to know more about how BPM helps us provide better service and stronger marketing solutions.